The European Space Agency announced Wednesday a ground station in Australia heard signals from Russia's marooned Phobos-Grunt Mars mission, but prospects are fading for the probe to reach the Red Planet as scheduled next year. A tracking station in Perth succeeded in contacting Phobos-Grunt, a 29,000-pound, truck-sized probe designed to retrieve samples from the largest moon of Mars and return them to Earth. Officials have been unable to contact Phobos-Grunt since a problem prevented the craft from exiting Earth orbit and accelerating toward Mars after liftoff Nov. 8. Russia sought help from ESA, which maintains a network of radio stations around the world. ESA's Perth station heard a signal from Phobos-Grunt at about 2025 GMT (3:25 p.m. EST) Tuesday, the space agency announced. It was one of four communications attempts Tuesday. There has been no contact with Phobos-Grunt since then, according to Rene Pischel, head of ESA's permanent office in Moscow. "The next communication session is being prepared for tonight," Pischel told Spaceflight Now. "It will be also from Perth." Pischel said "no meaningful telemetry" was received from Phobos-Grunt, adding there was only an acquisition of a radio signal from the orbiting spacecraft. 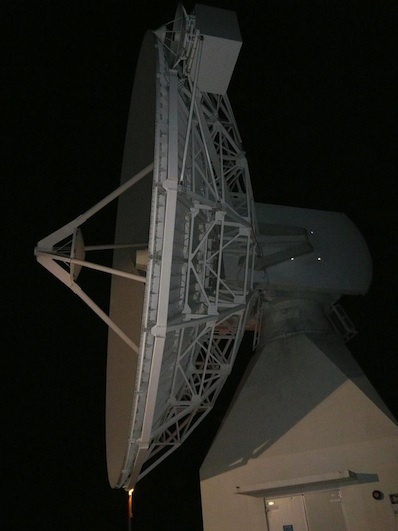 The Perth station's 49-foot dish antenna was tracking the probe as it flew overhead at more than 17,000 mph. ESA stations in French Guiana and the Canary Islands were also listening for signals from Phobos-Grunt. ESA said the ground stations were making their final effort to contact Phobos-Grunt on Tuesday after a request from Russian space officials. The extra communication attempt proved fortuitous. 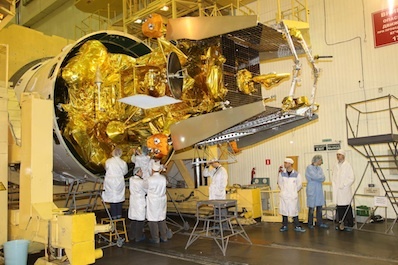 "ESA teams are working closely with engineers in Russia to determine how best to maintain communication with the spacecraft," the space agency said in a posting on its website. 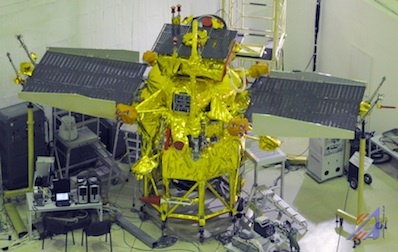 Russian space trackers had no success in contacting Phobos-Grunt since its launch two weeks ago. Earlier Tuesday, before the radio contact through Perth, the deputy head of Russia's space agency said there were slim odds of recovering the $165 million mission. "We must be realistic," said Vitaly Davydov, the deputy head of Roscosmos. "Once we've been unable to establish communication with the device for so long, the chances that this mission is still accomplishable are equal to nothing," Davydov told Russia's RIA Novosti news agency. After a Zenit rocket boosted the spacecraft into low Earth orbit, the probe's main propulsion pack was supposed to fire twice to push itself out of Earth's gravity and on a course to Mars. Neither engine firing occurred, and efforts to diagnose and resolve the problem repeatedly failed. Phobos-Grunt had a brief window to reach Mars when the planets were properly aligned to make the interplanetary journey possible. Vladimir Popovkin, the head of Russia's space agency, said after launch the mission could be salvaged until early December. But many experts said the launch period has already expired, meaning Phobos-Grunt would have to wait until 2013 for another shot at Mars. But that assumes engineers are able to regain control of the spacecraft and uplink fresh commands to fire its engines. Tuesday's brief contact did not produce telemetry to gain insight into the situation on-board the spacecraft, officials said Wednesday. Top officials with Roscosmos say Phobos-Grunt is likely functional and charging batteries through its solar panels. Its orienation appeared to be stable and there was evidence it was attempting to maintain its orbit. As of Tuesday, Phobos-Grunt was flying in a slightly elliptical orbit at an altitude of between 132 miles and 197 miles. Analysts estimate the craft could fall back to Earth between December and March. If Russia can't restore Phobos-Grunt and it succumbs to the effects of atmospheric drag, it would plunge back to Earth with a full load of toxic hydrazine and nitrogen tetroxide propellants. Russian officials said there was little threat from Phobos-Grunt if it re-entered the atmosphere, saying the dangerous fuel would dissipate or explode long before reaching the surface. Other debris, including a capsule with a heat shield, could survive the fiery re-entry and fall to the ground. The armored capsule was designed to return to Earth in 2014 with rocks from Phobos, the mission's namesake and the largest moon of Mars. The potential uncontrolled fall of Phobos-Grunt comes after NASA and German satellites re-entered in September and October. Both satellites, which were smaller and less massive than Phobos-Grunt, fell into the sea away from people.